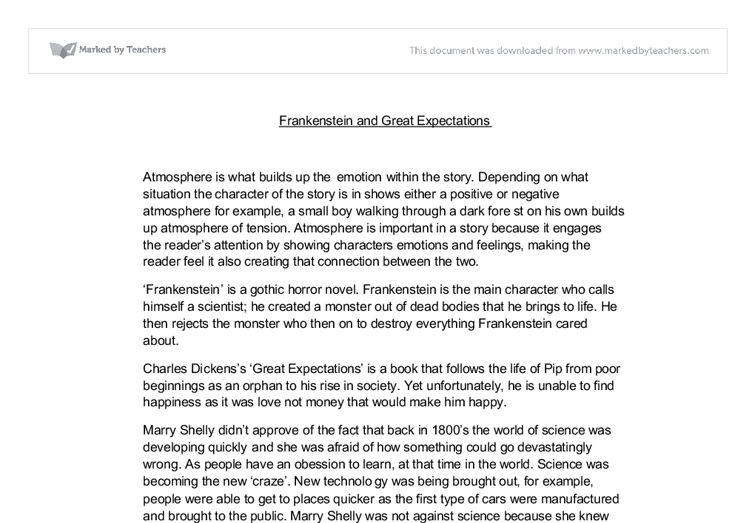 Frankenstein and Great Expectations Atmosphere is what builds up the emotion within the story. Depending on what situation the character of the story is in shows either a positive or negative atmosphere for example, a small boy walking through a dark forest on his own builds up atmosphere of tension. Atmosphere is important in a story because it engages the reader's attention by showing characters emotions and feelings, making the reader feel it also creating that connection between the two. 'Frankenstein' is a gothic horror novel. Frankenstein is the main character who calls himself a scientist; he created a monster out of dead bodies that he brings to life. He then rejects the monster who then on to destroy everything Frankenstein cared about. Charles Dickens's 'Great Expectations' is a book that follows the life of Pip from poor beginnings as an orphan to his rise in society. Yet unfortunately, he is unable to find happiness as it was love not money that would make him happy. Marry Shelly didn't approve of the fact that back in 1800's the world of science was developing quickly and she was afraid of how something could go devastatingly wrong. As people have an obession to learn, at that time in the world. ...read more. On the other hand, 'Great Expectations' opening paragraph is different to 'Frankenstein' as the atmosphere created is more welcoming. "My Father's family name being Pirrip and my Christian name Philip, my infant tongue could make of both names nothing more explicit than Pip". Pip comes to a decision on what he wants people to call him; this tells us that he is an orphan. Straight away, in the first sentence, we know whose story we are following as the grand author Charles Dickens introduces the main character to the audience. The first sentence of the novel seems welcoming for us as readers, who want to know more about this boy named 'Pip'. This opening sentence creates a very sorrow atmosphere as we know how difficult it would be to be in 'Pip's" situation. Charles Dickens uses writing techniques to create an atmosphere in 'Great expectations' novel. 'The sky was a row of black lines.' A writing technique used in the quote is pathetic fallacy; using the weather to create emotion. The words used, 'row of black lines' creates an image of a prison cell cage, telling me that there is no way out; this could explain the evilness from the convict (that 'Pip' will discover later on into the chapter), and how the boy of thirteen cannot escape from it. ...read more. Besides, in 'Frankenstein' the monster goes aggressive and seems to attack the mad scientist, Frankenstein, this is a great example of how the plot can be used to create such an effective atmosphere. 'One hand stretched out; seemingly to detain me ', the quote represents one of the key events that happened in chapter 5 of 'Frankenstein'; this is where the monster turns against his creator and reaches out to grab him. The verb 'detain' suggests that the monster wanted to do something further to hurt vulnerable scientist Frankenstein. The audience would feel shocked that this event took place after Frankenstein was so excited to see his outcome becoming very different to what he thought was going to be his 'beautiful' master piece, this creates a scary/tense atmosphere. 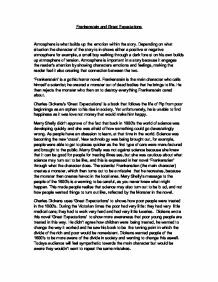 In conclusion I believe that both extracts, there was atmosphere created effectively and efficiently using a variety of different techniques for example pathetic fallacy and the use of metaphors. The most effective technique I think that is used from the two novels is "The sky was a row of black lines." from "Great Expectations". These two sections after being read would encourage the audience to look back on the time of 1800 and reflect their lifestyles to somebody's life in the 1800's. ...read more. This student written piece of work is one of many that can be found in our GCSE Mary Shelley section. The language of which Mary Shelley uses to inflict sympathy and pain upon Frankenstein reflects the reader's thoughts and feelings. To intensify Frankenstein's horror and disgust, a range of techniques are utilised. These techniques in turn reflect the gothic genre to which the novel belongs. Poe wrote every verse containing as much detail as possible to make sure the reader would perceive a very vivid image of the story. For example, in verse two, the last two full lines say "From my books surcease of sorrow - sorrow for the lost Lenore, For the rare and radiant maiden whom the angels name Lenore". How does Mary Shelley make the audience sympathise for the monster?